The Squadron 65 has been one of Fairline’s most successful boats in WA, and to sell any $2.7 million boats at all in the current economy suggests the builder must have got it pretty right. 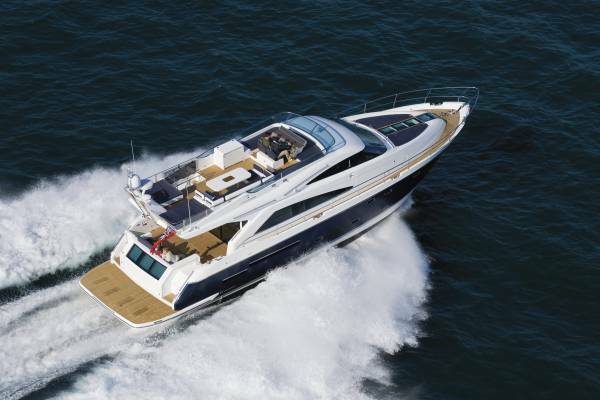 Not content with that though, Fairline has introduced a 65 Series II. A 65-footer is a big boat in most people’s language, but in their usual fashion Fairline has made it feel even bigger. One of the ways they make the most of available space is by making things rectangular instead of going for the curves of others. If you have say a rectangular vanity bench, why not mount a square basin on it? The saloon is laid out on those principles, although more accurately it should be described as lounge plus dining saloon in open plan. Entering through the expansive rear glass door puts you in the lounge area, with a U-shaped settee around a coffee table to port facing a monster Bang and Olufsen TV to starboard. Between them is what is precious in a cruiser – a lot of clear deck space. 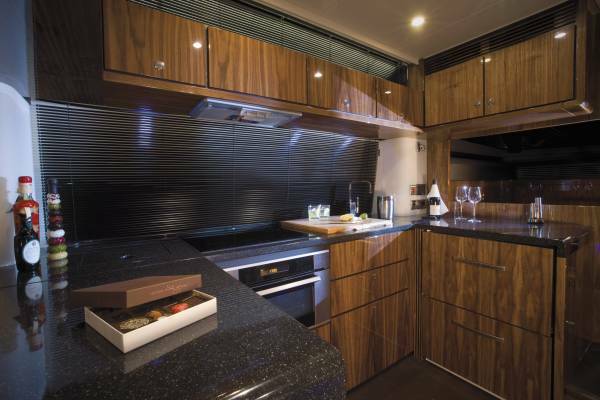 Ahead of this sub-compartment is the dining area to starboard facing a superb galley. Any owner not taking the 65 on at least one extensive annual voyage is cheating him or herself, and this is exactly the galley to take along. Short of perhaps spit roasted oxen, it is capable of producing practically any meal the most discerning guest list could request. Or you can cheat by hauling something ready-made out of the vast cold storage capacity and nuking it in the sophisticated microwave. A step up from this section puts you on what strongly resembles a flight deck. A pair of electrically adjusted chairs faces a console with displays, controls, switches and monitors to delight the little boy in us. They are also pleasingly logical, and as ergonomic as they come. The essential controls – throttles, gears, bow and stern thrusters – are duplicated in a remote control that plugs in aft for reverse parking. To aid movement between helm and mooring ropes there is a door aft of the seats leading to the side deck; a deck wide enough for easy transit. The Series II has upped the accommodation from three cabins to four, at the expense of dropping one bathroom: only three now instead of four. 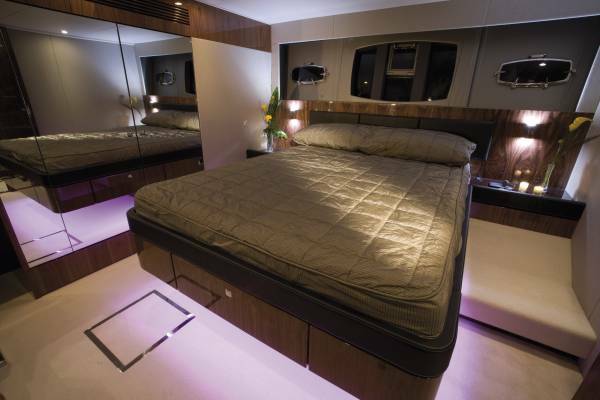 The master suite is amidships and huge; the VIP suite forward and merely very spacious. There is actually a fifth cabin, the nominal crew’s twin cabin aft with its en suite. With its private entrance and big window facing aft, it makes the obvious youngster’s accommodation. The 65 does outdoors very well. Besides the large cockpit, completely shaded by the flybridge, the flybridge itself has more deck space than the saloon. This is imported naked of shade, and is locally set up with whatever style of canopy the buyer wants. Just how much shade depends on the buyer’s enthusiasm for using the European-style sun beds. At the after end there is a pair of doubles, and forward a pair of singles flanks the two-seater control console. There is a second dining area up here, larger than downstairs, and a prince among wet bars. It has a barbecue as well as the usual fridge, ice maker and sink. The roomy cockpit has all the trappings of civilization: teak deck, as elsewhere on the boat, sitting and eating facilities, and a shower that folds out from the hydraulic swim platform to support itself at the right height. Warping capstans sit on the cockpit coamings, and their ropes live in dedicated bulwark lockers. 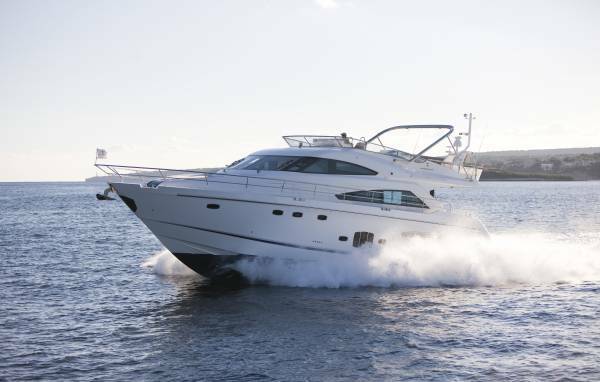 Fairline offers three choices of motor, although not a great spread of power, delivering between 30 and 32 knots. The review boat had the most powerful option, a pair of C18 Caterpillars rated at 1,150hp. Their home is an engine room rather than an engine space. Well laid out to commercial vessel standards, it allows easy access to the main engines and auxiliaries. The Squadron 65 has the open space and entertainment facilities for large numbers of day guests, but also has uncrowded sleeping accommodation for ten. Equipped with washer and drier, powerful air conditioning and ample cold storage, this is one to take to the Abrolhos.